Comfort food for cold toes. 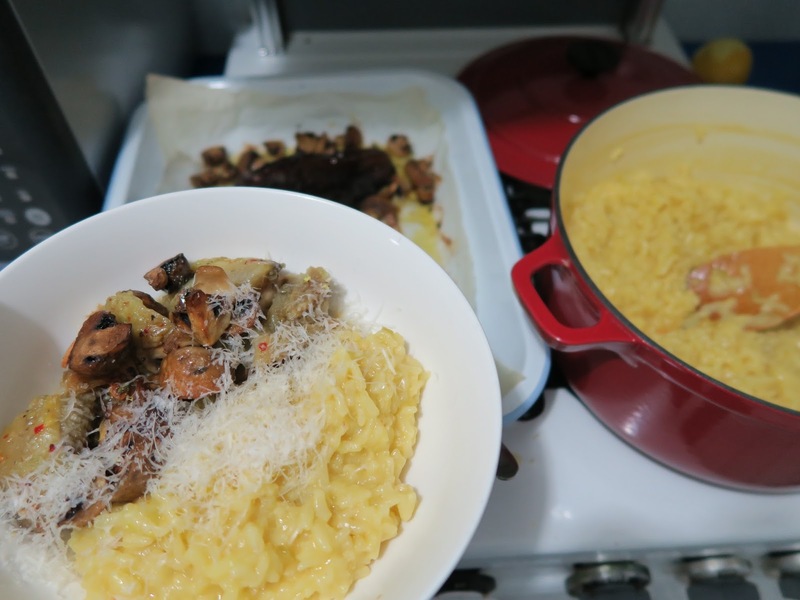 Saffron risotto with silky baked eggplant and thyme mushrooms. I came home on Thursday night from work with a brain that felt fried and an appetite for home-cooked comfort food. I watched a storm roll in from our bedroom window that turned the skies black in almost an instant, waiting in hope for the fireworks of lightening to start. I love a good storm. The blinds were swaying from the welcoming breeze and my toes were freezing. Arthur however, couldn't decide if he wanted to catch the blind cord which was knocking against the window edge or start biting my ankles for dinner. Yes my cat bites my ankles if I don't feed him quick enough, it's a serious case of hanger. Must take after his mother. With a crisper full of veggies for more then two people can possible eat before the next weekly veggie box delivery and a brain that can't think past the saffron risotto my parents made, I knew that sitting and watching the storm was not going to get me dinner. I was thinking baked eggplant (like this), saffron risotto that I used to eat growing up (I called it yellow rice) and thyme and garlic mushrooms that always went will the yellow rice. After I fed Arthur his nibbles to save my ankles I roughly halved and quartered a bag of button mushrooms and threw them in a lined baking tray along with a huge clove of roughly chopped garlic, some fresh thyme leaves that have been floating around the fridge for a couple of weeks but are surprisingly still green and a generous grinding of salt and pepper. I halved a medium sized eggplant and rubbed the cut side with a mixture of olive oil, garlic, chilli, lemon zest, salt and pepper and placed it cut side down on the baking tray nestled in between the mushrooms. Bunged it all in a preheated (180C) oven and forgot about it for 30 minutes while I cooked the saffron risotto. I feel I'm in good hands when a recipe starts with cooking onion and garlic until it's soft and fragrant, I don't know what it is about the smell but it promises a good meal and gets the hunger rolling (if it hasn't already started). I can have just started cooking dinner and only have the garlic and onion cooking in a pan when Tristan walks in saying 'Yes! it's out apartment that the smell is coming from!' then proceeded to snack on whatever is edible on the chopping board as swipe his hand out of the way. This risotto starts with finely diced onion, celery and a clove of crushed garlic sweated down in some olive oil until translucent and shiny. I then add the rice and cook for a minute or so until I hear a sizzle then pour two generous glasses of white wine, one for the pot and one for me. Once the wine cooked away I gradually added in the stock and a teaspoon of veggie stock powder (I know, don't turn your noses up. It won't taste like the one from my childhood if I leave this step out - stock cubes were the only stock I knew growing up) stirring pretty much the whole time. In a small ramekin I soaked a pinch of saffron threads in some freshly boiled water from the kettle and let it sit for about 10 minutes until it becomes a vibrant yellow. The saffron water went into the rice, tasted, seasoned then turned the heat off. Added a couple of knobs of butter, a large handful of freshly grated parmesan cheese and let sit for about 5 minutes with the lid on so it went all oozing, buttery and delicious. Everything came together at about the same time. The eggplant was a revelation. It had turned silky and just melted away from its skin when scooped out and it had soaked up all the flavours of the garlic, chilli, olive oil and lemon zest perfectly. The mushrooms were better baked then pan-fried like I normally do them, it was like their flavours intensified and they were more mushroomy if that makes sense. I served the scooped eggplant flesh along side the baked mushrooms and saffron risotto, a perfect meal when craving comfort food with cold toes. To my disappointment the storm passed with not a single drop of rain over head or a flash of lightening, as quick as it came, it went. 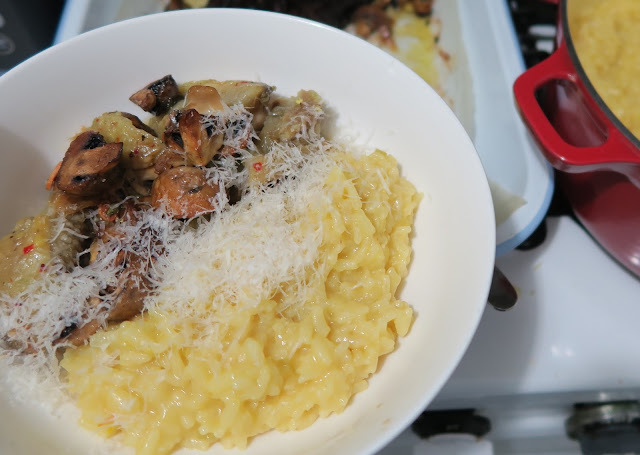 Saffron risotto with silky baked eggplant and thyme mushrooms. - Toss all ingredients together and scatter into a lined baking tray large enough to fit the eggplant in as well. - In a small bowl, mix together the olive oil, garlic, chilli and a generous grinding of salt and pepper. - Rub this all over the cut side of the eggplant and a sprinkling of lemon zest as well. The eggplant will soak up the olive oil which is what will make it go silky as it cooks. Place cut side down in the same baking tray you put the mushrooms and place in a preheated oven for about 30 minutes. - In a medium sized pot, heat olive oil over a moderate to low flame and fry the onion, garlic, celery and 1/2 teaspoons fine table salt for about 5-8 minutes, until the onions are translucent but haven't coloured. - Meanwhile, soak you saffron threads in about 1/3 cup of freshly boiled water and set aside for about 10 minutes or until the water becomes a vibrant yellow then add it to your rice. - Next add your rice to the onions and garlic, stirring constantly until it you hear a sizzle, about a min or two. Then pour in your wine, once that had been all soaked up add 1/2 cup of stock and stock powder, give it a good stir then let the rice soak up all the liquid before adding another 1/2 cup of stock. Keep adding the stock like this on a low simmer, stirring after each addition until all the stock has been added. If you haven't added your saffron threads and water, add them now and give it a good stir so the yellow colour goes through the whole dish. - Taste and check the rice still has a tiny bite left in it. You don't want a soggy mess, you want the rice to hold its shape and still have a tiny dot of white in each grain when bitten in half. Season with extra salt if you think it needs it then turn the heat off and add 3/4 of you parmesan cheese and the butter. Stir it through then clamp on a lid and let it sit for about 5 minutes. - Everything should have come together roughly about he same time. If your eggplant and mushrooms are done a little earlier then turn the oven off and let them hangout there. Scoop out the eggplant flesh and serve along side the mushrooms and saffron risotto. A sprinkle of cracked black pepper and some more parmesan cheese on top and you're ready to dig in. 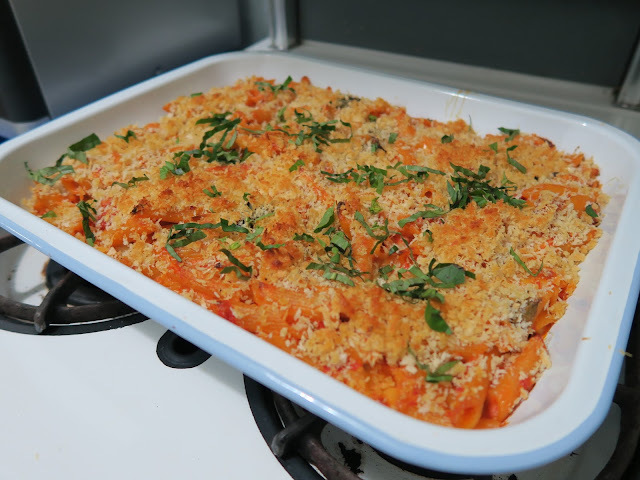 Saucy Baked Ziti from Stir by Jessica Fechtor. I just finished reading Stir, My broken brain and the meals that brought me home by Jessica Fechtor and whenever I finish a really great book I feel a little down after because I want more. I often find myself flicking through the last pages hoping that there is another page hidden somewhere in the back. It's a brilliant memoir which take you on her journey through to recovery after having a brain aneurysm rupture at 28 and how food and cooking brought her back into the kitchen which inturn helped her healing. She started a food blog called Sweet Amandine, named after her favourite almond cake during her recovery so she could share her stories and recipes. My words here can't do her book or writing justice. It's a touching memoir that makes you want to hug everyone you love just that little bit tighter and feed them till they are passed full. The writing in this book makes you feel like you were there through her pain, her recovery and when she finds her way back in the kitchen. How she learnt be the guest in her own home when normally she was the host. You crave the grilled salmon, dressed salad and crusty bread her and her husband make while away at a friends cabin and when she talks about taking her helmet off when she felt safe, it's like you were right there with her. Jessica Fechtor has a way with words that takes you with her and her story. And the recipes in this book match her writing, they are page splatterers, you can't help but want to get elbows deep in them. With a story behind each one it brings the food to life when you're cooking and knowing that someone all the way across the other side of the world made this recipe every week for Friday dinners and now it's found it's way into your little kitchen, it's a nice feeling to have while pottering around the kitchen. The first one that tickled my fancy before I'd even finished the book was the Saucy Baked Ziti. Only a few months ago I had never heard of Baked Ziti before, what on earth is this hashtag going around instagram!? A bit of googling and insta-stalking later I realised that it essentially was a type of pasta bake. The internet does not do this dish much justice to be honest and I'd never heard of this type of pasta called 'ziti'. 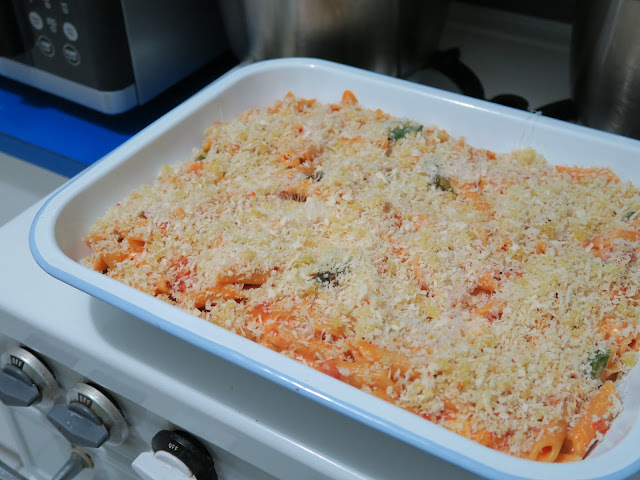 But then it popped up in Jess's book where she mentions that she never really knew what the fuss was about and I'll be honest again, either did I and I love a good pasta bake! If she didn't know what the fuss was about but the recipe has made it into her book then it must be worth a try and... Wholly Cow! It was good!! Rich and comforting but spicy and slightly creamy with cheese and basil throughout. Oh and how can I forget the panko bread crumb topping!?! 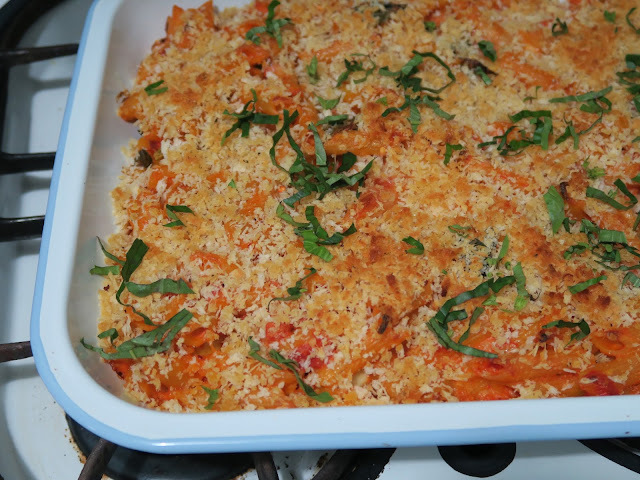 I'm going to say it... One of the best pasta bakes I've ever had. Jess's Saucy Baked Ziti rocked! Sorry to all the other hundreds of Baked Ziti recipes out there in the cyber void, I will forever stay true to this one. It does use a fair few pots but then it goes in the oven for 15 minutes for the final cooking and it gives you time to do an initial tidy and clean so you can sit down knowing that there is only your bowls and the baking dish left. I love a recipe like that and didn't mind the washing up at all for the final result. I will be making this again and again I can already tell. So delicious. I loved that Jessica shared her story with the world, thankyou. 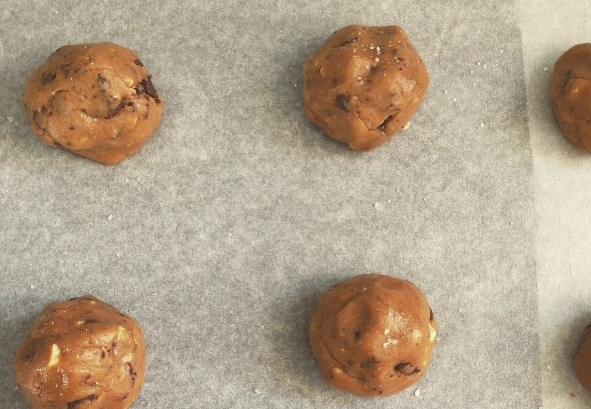 The only problem now is which recipe to make next... the wholemeal chocolate chip cookies? or the Butter Almond cake? or to throw a dinner party on a Friday night and serve freshly baked challah and roast chicken!? 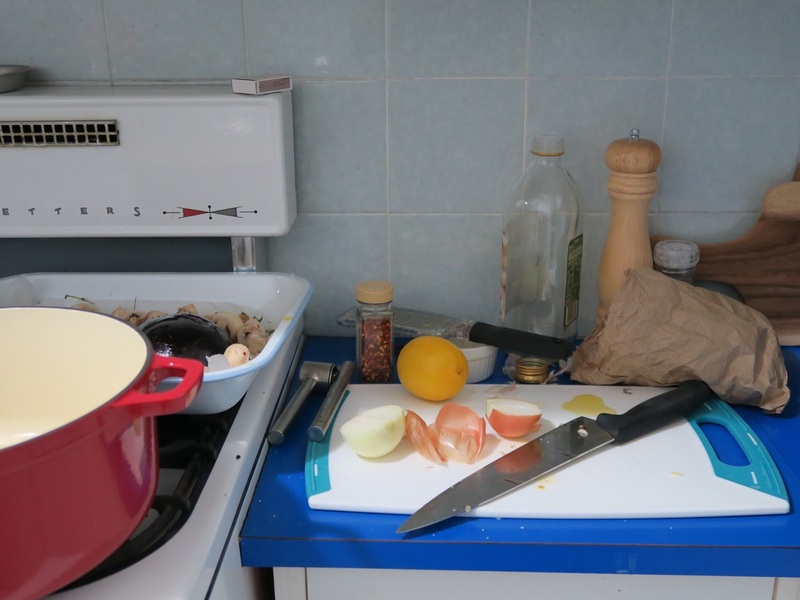 recipe from Stir, My broken brain and the meals that brought me home by Jessica Fechtor. - Preheat oven to 375F or 180C and brush a baking dish with olive oil. - Pour the 4 tablespoons olive oil into a saucepan and warm over medium-high heat. Stir in the garlic and crushed chilli flakes and cook for about 1 minute or so, until fragrant (be careful not to colour the garlic). Add the tomatoes, smooshing them up in your hands as you drop them in the pot along with all the juices. Stir in the salt and bring to a boil. Lower the heat and simmer for about 10 minutes, stirring occasionally until slightly thickened. Taste and add more salt or chilli if you'd like. Remove the pot from the heat and set aside. - Melt butter in a clean saucepan over medium head. Add the flour and stir for a couple of minutes to form a pale brown paste. Very slowly add the warmed milk while whisking continuously. Bring the sauce to a boil and cook for about 5 minutes, whisking the whole time until it thickens. Remove pot from the heat, stir in the salt and nutmeg then taste to see if you need anymore of either. Set aside. - Bring a large pot of salted water to a boil and add the pasta. Cook until it's 3 to 4 minutes short of being done. Drain and transfer to your largest bowl. Add the tomato sauce, bechamel, mozzarella and about three quarters of the parmesan and mix well.Transfer mix into prepared baking dish and scatter the ziti with the remaining parmesan. - In a small bowl, toss the bread crumbs with a pinch of nutmeg, some extra chilli flakes if you want a little extra heat and 2 tablespoons of olive oil and sprinkle over the top. - Bake until the ziti is bubbling and the top is brown, about 15 minutes. Remove from the oven and let rest for 10 minutes, then scatter the sliced basil over the top and serve. Tahini Kale Slaw and Roasted Tamari Portobello Bowl from Sprouted Kitchen's Bowl & Spoon. Over the past few years I've missed some break through recipes that have taken the internet by storm, inspirational bloggers I'm only just finding out about now and cookbooks which weren't on my radar for any good reason at all except that I was wrapped up trying to finish my apprenticeship and worrying about what I wanted to be when I grew up. Having taken a big step back I'm finding my feet again and all these things I've missed out on. It's amazing what happens when you chill out and open your eyes to see what else is around you. One of the blogs and cookbooks I've missed because I'd been wearing worry blinkers is the Sprouted Kitchen blog. The Sprouted Kitchen is a beautiful food blog run by Sara and Hugh Forte, she cooks and he captures. They focus on seasonal based recipes full of salads and vegetables but don't worry because there is still a healthy serving of cheese and chocolate throughout. Earlier this year they released their second cookbook called Bowl & Spoon which is all about fresh, healthy food that is served in the convenience of a bowl. I think the bowl is extremely underrated and the possibilities are endless when you get thinking (or flicking through this amazing book). I made the Tahini Kale Slaw and Roasted Tamari Portobello Bowl for dinner a couple of weeks ago and boy oh boy was it tasty. Every mouthful was bursting with flavour and it was different than what I normally cook, I loved it. You could serve it warm or cold. For dinner we had to warm and then for lunch the next day I had it cold and it was just as good (maybe even better...). The baked mushrooms with the drizzle of soy sauce and sesame oil soaked up all the flavour and intensified when baked in the oven and the brown rice was a great staple to soak up juices and dressing but also give a nuttiness brown rice naturally has. I cheated and used bag of pre-washed baby kale for the salad instead of regular kale so I didn't have to fuss about with the stems and washing it. By all means use regular kale but I like how baby kale isn't as rough and chewy as regular can be when it's raw in a salad. And of course it's topped with avocado... you can never go wrong by adding avocado to anything. All the elements were pretty easy to prepare and put together, the only thing was I had about 8 dirty bowls by the end of it and a whole sink full of spoons (that could have been because I keep insisting on tasting each thing) so my only flaw with the recipe if making all the elements at once is the washing up but you know what... it's so worth it! Looking forward to trying to 'Hippie Bowl' next, just have to convince Tristan that the Tofu is actually chicken or something haha. - First things first. Preheat your oven to 180C, cook your rice if you have not already done so (see this link for how) and keep warm if serving this bowl as a warm dish then make the Tahini Citrus Miso Dressing (recipe below). Now you are ready to keep going. - Line a baking tray with foil or baking paper. Remove the stems of the mushrooms and drizzle with sesame oil, soy sauce and a little freshly cracked pepper (remember the soy sauce is salty so no need to salt them) and place them in the oven, gill side up for about 15-20 minutes until they are soft and look like they have collapsed. Once cooked, slice into strips. - While the mushrooms cook, combine the baby kale, grated carrot, spring onions, parsley and toss with dressing using as much as you desire. I found the dressing very full bodied so used about 3-4 tablespoons of dressing and then added a tiny drizzle over the top when serving. - To create this delicious bowl, serve each one with a healthy serving of kale slaw, a good scoop of brown rice, a sliced mushroom each, half a diced avocado and a generous sprinkling of toasted sunflower seeds. Then dig in! This can be served warm, which is how I had it for dinner or cold which is how I had it the next day for lunch and both were just as delicious! Note: For the roasted and salted sunflower seeds I through 1/3 cup onto a baking tray with about 2 teaspoons of extra virgin olive oil and a generous sprinkling of sea salt and popped them into a 180C oven for about 5-10 minutes until the were fragrant and slightly coloured. You can toast them for longer or less, depending on your preference. Warning... if you start snacking on them, you wont be able to stop. - In a mixing bowl whisk tahini, miso paste, honey, sesame oil and hot sauce to combine. Make sure all the lumps are out so you don't get a chunk of any one ingredient. - Next whisk in the vinegar, orange juice and the salt and pepper to taste. Add the lemon juice to taste next, one tablespoon at a time (I used the whole lemon but I like dressing on the tangy side) or use a little water to thin the dressing down. 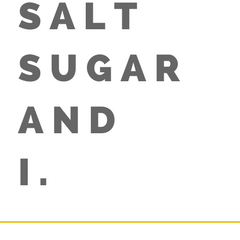 Taste and add any extra salt and pepper you might think it needs and keep in an airtight container in the fridge. A little ramble about night-time baking. I wanted to insert a meaningful or inspirational quote that sums up food and life but instead I opted for cookies. Thats inspiration right? Over the past two weeks I've changed. I've started baking at night time after work again which is something I used to do before I knew there was a whole other world of food out there, before I found food blogs, before Masterchef and before I thought I wanted to work in a commercial kitchen. It originally started purely as a selfish act. When I wanted something warm, comforting and sweet but a prepackaged cookie wouldn't suffice, I baked and thats how my love of cooking started. I'd always loved food.. I've been an avid eater from day dot. I'm having a bit of a soup obsession lately. I think it could be that all I feel like doing when I get home from work is curling up on the couch with a big bowl of steaming soup. Growing up my mum didn't make many soups, mainly because my dad has never been a fan of them. Why? I don't understand because I can't get enough of them this winter. 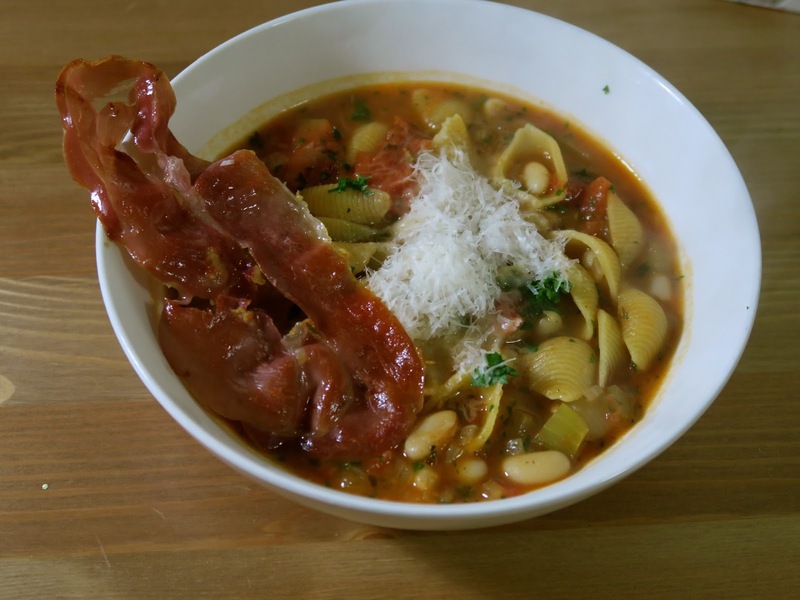 I made Pasta e Fagioli with Crispy Prosciutto from Ashley Rodriguez's new cookbook 'Date night in' last Tuesday night and it only scraps the surface of whats in this cookbook. This book is full of inspirational menus bursting with ideas, the chapter introductions give you an insight into her home and kitchen and the date nights she shares are just special. Some of the menu's have a cocktail to start the chapter, which is her husbands forte but most of the menu's have entree, main and dessert. Flicking through the pages makes me wish date night was every night but I don't know if I could mentally cope with the amount of washing up after each night if we were to have three courses each night. I am envious of all dishwasher owners. She has make-ahead tips and tricks throughout the whole book which could also work for dinner parties if you doubled recipes. It makes me want to rent a bigger apartment to fit a bigger dining table with more chairs so I can host dinner parties each week. I didn't make the whole kit and caboodle for dinner on Tuesday night, just the main which I originally thought was a pasta recipe by looking at the photo but boy was I wrong. I was in for a delicious pasta and bean soup with a crispy piece of prosciutto on top. Perfect for a cold night in watching 'House of Cards' on Netflix (I am completely obsessed with this show right now). The soup itself was relatively easy but didn't compensate on flavour. Ashley gives you a make-ahead tip so you can reheat a couple of days later but to make sure you cook the pasta just before serving and not beforehand so it keeps it's al dente bite. I of course double the amount of pasta which meant I had to also double the liquid too... I couldn't help myself... I love pasta and it did mean there was sufficient leftover for greedy guts me and Tris for work the next day but I agree with Ashley on the make-ahead tip. If you are making this the day before don't add the pasta until you want to serve it. The pasta soaks up all the liquid and it turns into more of a past with sauce rather than a pasta soup. Now don't be scared of double carbing here. Beans and pasta you say...hmmm. I say... it's amazing! It gives the soup a creaminess without having to actually add cream. It allows the soup to keep all the fresh flavours of the herbs and tomatoes which cream can sometimes dull down. I also really loved the prosciutto which was fried till crispy and served on the side so you could break it up into your soup. It intensified the flavour of it and now and again you found a salt bit of crunch. yum. Am thinking Braised Pork Chilaquiles with Roasted Tomatillo Salsa and Pickled Red onions next and maybe a Aperol Spritz or two. Recipe by Ashley Rodriguez from her cookbook 'Date Night In'. - Heat olive oil in a large pot or dutch oven over medium heat and saute the onion, celery, garlic, salt, oregano and thyme for about 8 to 10 minutes until fragrant and the onions are translucent. 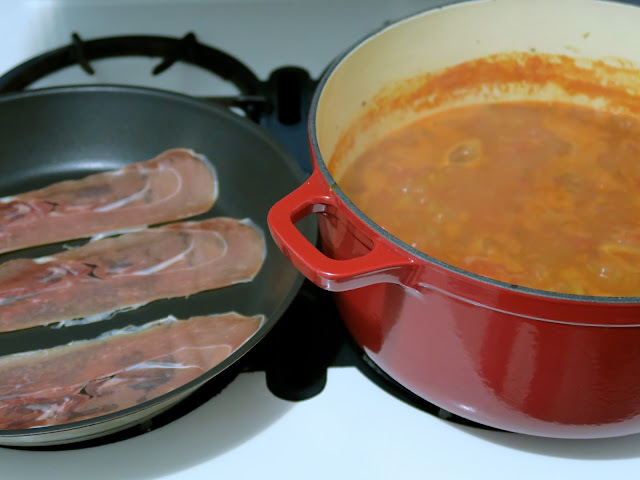 - Add the chicken stock, beans and tomatoes and bring everything to a boil. Reduce to a gentle simmer and cook for about 10 minutes- If you are making the soup in advance, stop here and store in the fridge for up to 2 days. - When you are ready to serve dinner, bring the soup back to the boil and add the pasta and cook according to packet instructions or until pasta is al dente, about 10 - 12 minutes. - Meanwhile, crisp the prosciutto in a non-stick frying pan or skillet over medium-high heat until it shrivels and the fat has rendered, about 1 - 2 minutes on each side. Transfer it onto some paper towel. Once the prosciutto cools it will turn crispy. 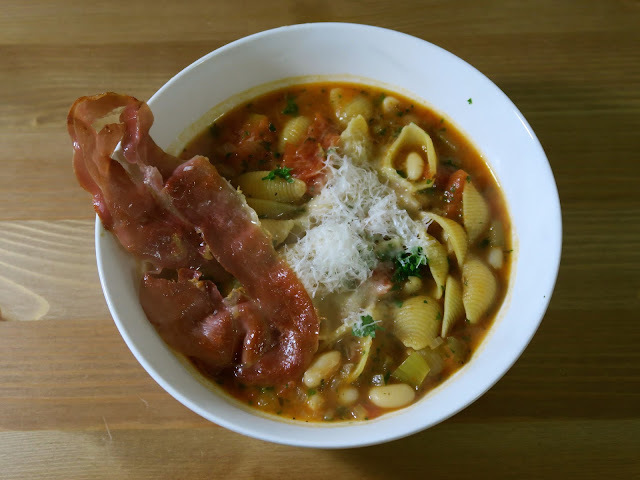 - Once the pasta is cooked, stir in the parsley, taste and adjust seasoning (keep in mind that the prosciutto and parmesan are salty) and serve with grated parmesan and a piece of crispy prosciutto on top.